Despite the faster services available to the West Country I opted to take the old Southern Railway route from London Waterloo to Exeter St. David's. Waterloo station is easily Britain's busiest railway station in terms of passenger usage and one of the busiest terminals in Europe having more platforms and a greater floor area than any other station in the UK. On a Saturday afternoon however it is a much quieter station and you can enjoy some exploration perhaps admiring the large four-faced clock hanging in the middle of the main concourse which has always been a traditional place to rendezvous. 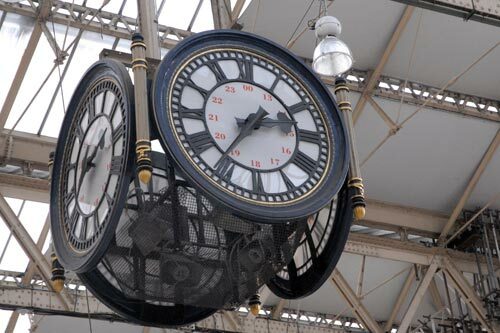 Photo - The famous clock above the main forecourt at London Waterloo famous as being the prefect rendezvous. Leaving Waterloo promptly at 14.20 on board a six car class 158 DMU, I looked forward to a journey of just over 172 miles which was scheduled to take 3 hours and 20 minutes. Benefitting from a comfortable seat in first class I looked forward to an interesting and scenic journey. Immediately leaving Waterloo you get a good retrospective view of London's skyline on the right hand side with the newly opened Shard the highest building in the panorama. A few minutes later you reach Clapham Junction, one of the busiest stations in Europe with over 100 trains an hour outside peak periods. Speeding through Wimbledon (of tennis fame) you reach Esher. On the left just past the station is Sandown Park which is still a Mecca for horse racing. Racing of another kind is seen just after Weybridge station with the Booklands motor racing circuit on the left. Opened in 1907, it was the first circuit in the world and saw its last race in 1939. Not that far beyond Brooklands, and also on the left hand side, is the Shah Jahan Mosque built in 1889 and the first mosque to be built in Europe. Its distinctive green dome makes recognition easy. Shortly after passing Woking, you reach Brookwood where the extensive cemetery on the left hand side was operated by the London Necropolis Company with the dead being shipped out from London by train to be buried in Surrey. By 1945 this service had been replaced by road services. Next stop is Basingstoke in Hampshire and by now urban development has diminished and green countryside has become dominant. From here onwards through the lovely rolling country of this part of Hampshire many of the valleys contain watercress beds which were convenient to supply the hungry mouths of London. Andover with its strong connections to the Ministry of Defence is the next stop. A lengthy tunnel announces the approach to the Cathedral city of Salisbury with the tallest spire in England dominating the skyline on the left hand side. From Salisbury west this once busy main line has been reduced to single track in many places. Recent reinvestment has seen some reinstatement of double track although as in the case of Tisbury the loop is just outside the station! The route continues over the border into beautiful Dorset to reach Gillingham (with a hard G). Another change of county takes the train into Somerset and a stop at Templecombe. Once a busy junction station with the old Somerset and Dorset railway, which linked Bath with Bournemouth, it is sad to see how much railway Britain lost during rationalisation in the 1960s. A return to Dorset between Sherborne and Yeovil Junction provides more lovely countryside to enjoy. A brief return to Dorset at Crewkerne before the route enters Devon and the carpet town of Axminster. Devon is another county famed for its rural charm and the view from the train offers a continuously changing panorama of fields and rolling hills. A lone deer grazed nervously near the line and we sped into the gathering darkness with bare trees silhouetted against the brighter western sky. Honiton and another two stops and we reached Exeter Central before the short and steep descent to Exeter St. David's station on the former Great Western Railway route to the west of England. Despite being a slower route to Exeter there is much to see and plenty of countryside to enjoy. Although the route can no longer be considered a main line, the trains maintain decent speeds between stations on a tightly timed schedule. Evidence of the line's former Southern Railway ownership can still be seen with plenty of examples of the company's fondness to build in concrete. From a passenger's point of view the stations all seemed well maintained with plenty of passengers using the service. Leaving the train I was pleased to have travelled the route promising to return one day to see the many points of interest I had missed on my first trip.